Qarib Qarib Singlle is not a film that can be rushed. It moves languorously, pausing to savour moments at will, notes Savera R Someshwar. Normal love stories are rarely filmi. They don't feature a hunky, handsome hero or a curvaceous, gorgeously made-up heroine. They don't have perfect lines to deliver, apt responses at the right time and lavish romantic gestures. Instead, normal love stories rub along, smoothing out jutting edges until the two partners can fit comfortably, if not perfectly. And when one attempts to find love while shouldering the baggage of age and past relationships, it can get a wee bit more complicated. Jaya, an army widow, has limited her life to her work and family and, as a friend unkindly but aptly named her, as a useful 'stepney' who can babysit both kids and cats. The initial few responses are off-puttingly creepy, leaving her wondering what she getting into. Only Yogi, who's in his 40s and believes life should not be taken too seriously, speaks non-stop (bakar-bakar, she lashes out in agonised frustration at one point) and cracks silly jokes and cracks up at them himself. She has her routine set, her defenses up and takes annoyance at the drop of a hat. He pops up in brightly coloured clothes, she hides behind safe pastels. She's a vegetarian; he likes his meat and believes a well-made biryani and well-made raita make for a mouth-watering combination. He's convinced he's cool; she's convinced he's self-obsessed. In order to pop that particular bubble -- he genuinely believes his former girlfriends haven't gotten over him because he's so irresistible -- she challenges him to take a reality check and finds herself roped into a trip to Rishikesh, Bikaner and Gangtok where said ex-girlfriends stay. In a journey filled with its fair share of mishaps -- which includes a pakoda-chasing Yogi clambering onto the wrong train, heading in the wrong direction, as Jaya is borne away in the beautifully appointed Fairy Queen -- there begins, still unknown to the protagonists, a journey of emotional discovery. It takes an interesting stranger, three sleeping pills and two exes -- a former girlfriend and boyfriend -- to spark off the green-eyed monster and a questioning as to what each means to the other. Qarib Qarib Singlle, like the relationship between Yogi and Jaya, is not a film that can be rushed. It moves languorously, pausing to savour moments at will. Which may not make it everyone's cup of tea. The talented Paravathy Thirovoth Kottuvatta -- in a sly nod to her real surname, she tweaks her name from Jaya Sashidharan to Jayashree TK on the dating Web site, Ab Tak Singlle -- is a refreshing watch. Not just in terms of her acting, but also the way in which she has portrayed her mid-30s, working woman character. The clothes she wears, the issues she faces, the kilos that should not be there, the binge-eating, the imperfect skin, the travails of being a single woman, the fear of putting herself out there for rejection as she attempts to find love again is so very real. She's strong, she's weak, she's hurt, she can retaliate, she's impatient, she's scared... she's human, she's normal. 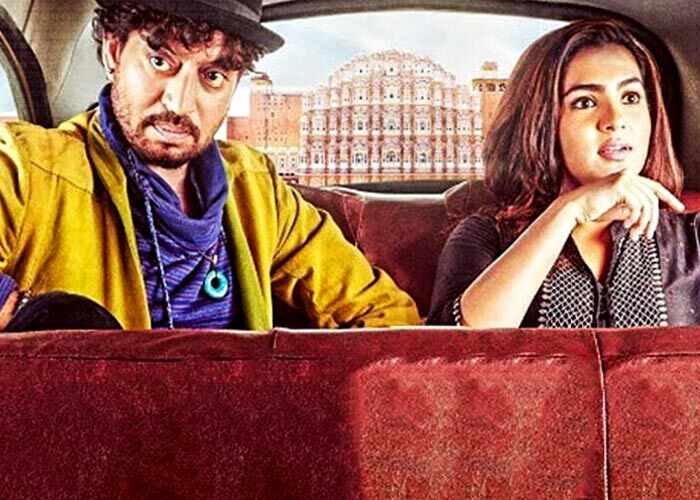 Irrfan Khan's Yogi doesn't believe in disturbing the flow and the actor manages the delicate balancing act between being annoying and likeable. But a little more depth to his character would have been nice... even when the movie ends, we don't -- unlike Jaya's character -- know who Yogi really is. And if, in the end, you like Yogi, it's because of the deft skills of the actor himself; though I wager you will still like Monty in Life... In A Metro and Rana in Piku better. The other characters in the movie, sadly, don't have a fighting chance. Those who, despite this, make an impression do so simply on the basis of their acting chops; Pushtii Shakti and Bijendra Kala, take a bow. While Ghazal Dhaliwal's screenplay has lines that generate laughter, the credit needs to be equally shared with the actors for the manner in which they have used them. Director Tanuja Chandra, who returns to the big screen after more than a decade, makes a decent -- if slightly rusty -- return to the big screen. Breaking the fourth wall, something that Kader Khan used to generate laughs in films like Ghar Ho To Aisa -- makes an uncomfortable comeback in Qarib Qarib Singlle. But the 'mature' audience -- the 10 am show I watched had a women-dominated audience, most of whom were in their late 40s or early 50s -- certainly loved Chandra's 'mature' love story.